Yeasts, mostly Candida, are important causes of bloodstream infections (BSI), responsible for significant mortality and morbidity among hospitalized patients. The epidemiology and species distribution vary from different regions. The goals of this study were to report the current epidemiology of Candida BSI in a Shanghai Teaching Hospital and estimate the impact of appropriate antifungal therapy on the outcome. From January 2008 to December 2012, all consecutive patients who developed Candida BSI at Ruijin University Hospital were enrolled. Underlying diseases, clinical severity, species distribution, antifungal therapy and its impact on the outcome were analyzed. A total of 121 episodes of Candida BSI were identified, with an incidence of 0.32 episodes/1,000 admissions (0.21 in 2008 and 0.42 in 2012) The proportion of candidemia caused by non-albicans species (62.8%), including C. parapsilosis (19.8%), C. tropicalis (14.9%), C. glabrata (7.4%), C. guilliermondii (5.8%), C. sake (5.0%) was higher than that of candidemia caused by C. albicans (37.2%). The overall crude 28-day mortality was 28.1% and significantly reduced with appropriate empiric antifungal therapy administered within 5 days (P = 0.006). Advanced age (OR 1.04; P = 0.014), neutropenia < 500/mm3 (OR 17.44; P < 0.001) were independent risk factors for 28-day mortality, while appropriate empiric antifungal therapy (OR 0.369; P = 0.035) was protective against 28-day mortality. The epidemiology of candidemia in Shanghai differed from that observed in Western countries. 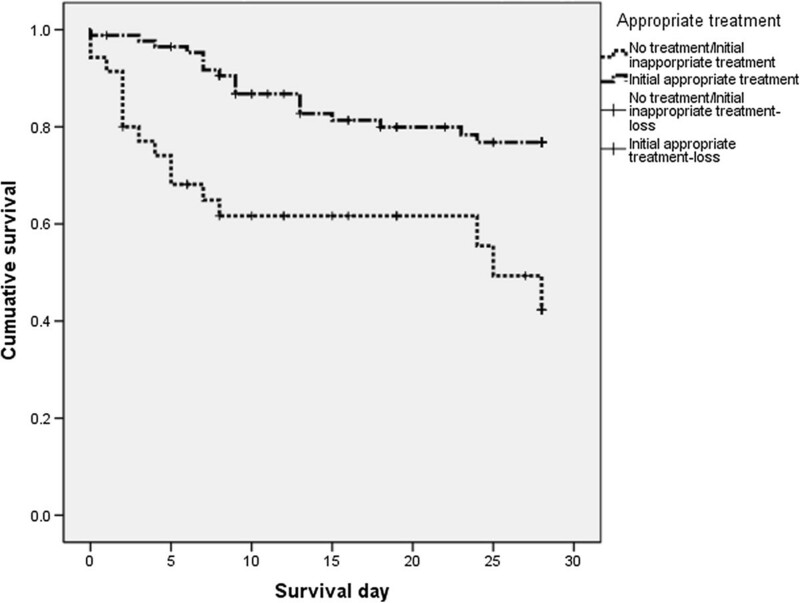 Appropriate empiric antifungal therapy influenced the short-term survival. Yeasts, mostly Candida spp. are currently between the fourth and the sixth most common nosocomial bloodstream isolate in American and European studies [1, 2]. However, their incidences vary according to geography but overall continue to increase worldwide [3–6] except in North America and China [4, 7, 8]. Risk factors include exposure to broad-spectrum antibacterial agents, increased complexity of surgical procedures, prolonged use of central venous catheters, dialysis, corticosteroids and cytotoxic chemotherapy . Although C. albicans has long been the most common species isolated during candidemia, recent studies have demonstrated a shift towards non-albicans species, such as C. parapsilosis, C. glabrata and C. krusei[3, 10], especially in intensive care unit and hematological patients [11–13] and/or in case of antifungal pre-exposure [14, 15]. Guidelines on the treatment of candidemia have been developed [16, 17], with a consensus that all candidemic patients should receive antifungal therapy. Although novel antifungal drugs have been developed since the last decade, 90-day mortality rates due to candidemia remain as high as 50-70% [12, 18, 19]. In addition, data from several studies showed that 30-day mortality rates and costs of care increased significantly when empirical therapy was delayed or inadequate (inappropriate dosage, resistant isolate) [20–24]. We provide herein a laboratory-based report from a tertiary care hospital in Shanghai, China, assessing the epidemiology, species distribution, antifungal therapy and outcome of Candida blood stream infection (BSI). Risk factors related to 28-day crude mortality were also analyzed. A retrospective analysis of consecutive Candida bloodstream episodes in adults collected from the microbiology database of a 1300-bed tertiary care hospital in Shanghai, China was performed over a 5-year period. Demographics, underlying diseases, co-morbidities, severity of clinical features, Candida species distribution, time from admission to onset and turnaround time (TAT) of final report of blood culture were compared among the patients infected with different Candida species. A case of Candida BSI was defined as a patient with at least one blood culture positive for a Candida. Definition of sepsis was signs and symptoms of inflammation plus infection with hyper- or hypothermia (core temperature >38.3°C or <36.0°C), tachycardia (90 min−1 or more than two SD above the normal value for age), and at least one following tachypnea or leukocytosis (WBC count > 12,000/mm3) or leucopenia (WBC count <4,000/mm3) or normal WBC count with greater than 10% immature forms. \Neutropenia was defined as <500/mm3 absolute neutrophil count. Prior corticosteroid was defined as receiving >1 mg/kg/d prednisone for more than 1 week or equivalent before Candida BSI onset. Isolates were detected from blood cultures using the BACTEC™ FX system (Becton Dickinson, Inc., Sparks, MD, USA). Flucytosine, amphotericin B, fluconazole, voriconazole, and itraconazole susceptibility testings were performed using the ATB® FUNGUS 3 system (BioMérieux, France), which was wildly used in China , providing susceptibility to antifungals results markedly concordant with those obtained using CLSI and EUCAST methodologies . For triazoles, the minimal inhibitory concentration (MIC) was determined by determining the concentration at which a prominent reduction in the yeast cell count was observed after 24 h of treatment. The MIC for amphotericin B and flucytosine were defined as the lowest concentration at which no visible growth was detected. CLSI-24 h resistance breakpoints (CBPs)  for fluconazole, itraconazole and voriconazole, recently approved, were used: susceptible (S) ≤2 μg/mL, susceptible dose-dependent (SDD) 4 μg/mL, and resistant (R) ≥8 μg/mL for fluconazole and C. albicans, C. tropicalis, and C. parapsilosis and ≤32 μg/mL (SDD), ≥64 μg/mL (R) for C. glabrata; S ≤0.12 μg/mL, SDD 0.25-0.5 μg/mL, R ≥1 μg/mL for voriconazole and C. albicans, C. tropicalis, and C. parapsilosis, and ≤ 0.5 μg/mL (S), 1 μg/mL (SDD), ≥2 μg/mL (R) for C. krusei; S ≤ 0.12 μg/m, SDD 0.25-0.5 μg/mL, R ≥1 μg/mL for itraconazole and C. albicans. Due to lack of CBPs of amphotericin B and flucytosine for Candida spp. and itraconazole for Candida non-albicans, the epidemiological cutoff values (ECVs) were used for them: S ≤2ug/mL, R > 2ug/mL for amphotericin B and Candida spp. ; S ≤0.5ug/mL, R > 0.5ug/mL for flucytosine and C. albicans, C. tropicalis, C. glabrata and C. parapsilosis; S ≤32 ug/mL, R > 32ug/mL for flucytosine and C. krusei, S ≤1ug/mL, R > 1ug/mL for flucytosine and C. guilliermondii; S ≤0.5ug/mL, R > 0.5ug/mL for itraconazole and C. parapsilosis and C. tropicalis; S ≤1ug/mL, R > 1ug/mL for itraconazole and C. krusei and C. guilliermondii; S ≤2ug/mL, R > 2ug/mL for itraconazole and C. glabrata. Initial appropriate antifungal treatment was considered when the appropriate drug (based on subsequent in vitro susceptibility results) with adequate dosage was started within 5 days the first blood culture performed. Adequate dosage of antifungal agent was defined according to IDSA 2009 guidelines : 400-600 mg/d fluconazole for fluconazole susceptible Candida spp. ; ≥0.5 mg/kg/d of amphotericin B deoxycholate; ≥3 mg/kg/d of any lipid formulation of amphotericin B; 70 mg of caspofungin × 1 dose followed by 50 mg/d and 6 mg/kg of voriconazole b.i.d. × 2 doses followed by ≥ 3 mg/kg b.i.d.. Patients who did not receive any antifungal were considered as having received inappropriate therapy. Crude mortality was registered after 28 days from the occurrence of the episode of Candida BSI. The study was approved by the local institutional review board (Ruijin Hospital, Shanghai Jiaotong University, School of medicine) and written patient consent was not required because of the observational nature of this study. Descriptive analyses were used for baseline characteristics and subgroup analyses (by Candida species). Continuous variables such as age, length of hospital stay, time from admission to infection and TAT of final results of blood culture were expressed either as means and standard deviations (SD). The Chi-square-test or 2-tailed Fisher Exact-test was used to compare categorical variables. The survival distribution function was estimated using the Kaplan-Meier method. To define risk factors for mortality, multivariate logistic regression analysis and adjusted odds ratio (OR) with 95% confidence interval (CI) were calculated. Variables that were associated with 28-day mortality in univariate analyses with a P value of < 0.16 were entered into multivariate analysis. 2-tailed tests of significance at the level of a P value of <0.05 level were used to determine statistical significance. Statistical analysis has been conducted by using the program SPSS 19.0. A total of 121 episodes of yeast BSI were identified during the study period (1st January 2008 to 31st December 2012), with an incidence of 0.32 episodes/1000 admissions. The incidence increased from 0.21 in 2008 to 0.42 episodes/1000 admissions in 2012 (0.21 in 2008, 0.24 in 2009, 0.26 in 2010, 0.44 in 2011 and 0.42 in 2012). The number of blood culture/1000 admissions obtained yearly in our hospital was 118.2, 116.0, 117.9, 147.6 and 166.1, respectively, while in ICUs, the number of blood culture/all blood culture yearly was 11.4%, 11.7%, 11.3%, 11.1% and 12.3%, respectively. All cases were nosocomially acquired. The demographic characteristics of the patients are summarized in Table 1. The mean age of patients was 57.3 years and 71.9% were male. The distribution of C. albicans and non-albicans strains had no significant difference according to patients’ origin (p = 0.07), as shown in Figure 1. 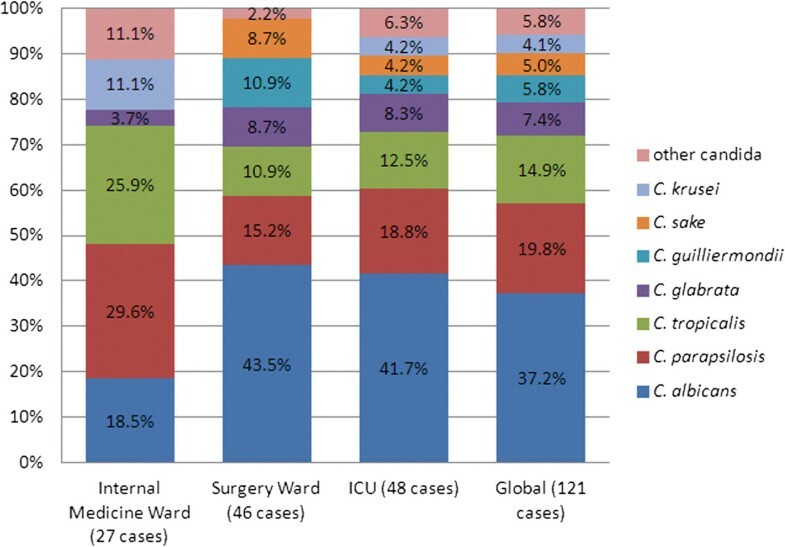 C. albicans was isolated in 18.5% of cases in internal medical wards while in 43.5% and 41.7% in ICU and surgery wards, respectively. However, there were a higher proportion of C. parapsilosis and C. tropicalis isolates in internal medical ward than in ICU or surgery ward. Mean TAT for C. glabrata (6.11 ± 1.36 d) was significantly higher than that observed for other Candida species (3.9-4.8 ± 0.8-1.5 d) (P = 0.002). Distribution of the Candida species by origin [ C. albicans vs. C. non- albicans (p = 0.074)]. *Other Candida spp. includes C. lusitaniae (2), C. intermedia (2), C. theae (2) and C. haemulonii (1). The majority of patients (95.0%) had at least one co-morbidity at the time of the diagnosis of Candida BSI. Twenty-six patients (21.5%) had solid organ tumor, 18 (14.9%) had hematologic malignancy, 16 (13.2%) had diabetes mellitus, 12 (9.9%) had chronic renal failure, 32 (26.4%) had cardiac disease and 26 (21.5%) had chronic pulmonary disease. Twenty patients (16.5%) received corticosteroids, 66 (54.5%) underwent a surgical intervention within 30 days and 16 (13.2%) had received antifungal agents as prophylaxis or empirical therapy within 30 days prior to their onset of Candida BSI. Sixty-eight (56.2%) patients had at least two co-morbidities. No patient had human immunodeficiency virus (HIV) infection. Regarding the severity of clinical feature, 48 (39.7%) received at least 7-day parenteral nutrition, 22 (18.2%) were mechanically ventilated, 12 (9.9%) had renal replacement therapy, and 14 (11.6%) had absolute neutrophil count < 500/mm3. Patients infected with C. parapsilosis, C. glabrata or C. krusei had lower rate (44%-60%) of sepsis signs compared to those infected with other Candida spp. (more than 85%). The clinical characteristics (underlying disease, severity of clinical feature) of the patients, by Candida species are shown in Table 2. Forty-five (37.2%) of Candida BSI were C. albicans and 76 (62.8%) were non-albicans Candida. In non-albicans Candida sepsis cases, 24 (19.8%) were caused by C. parapsilosis, 18 (14.9%) by C. tropicalis, 9 (7.4%) by C. glabrata, 7 (5.8%) by C. guilliermondii, 6 (5.0%) by C. sake, 5 (4.1%) by C. krusei, 2 (1.7%) by C. lusitaniae, 2 (1.7%) by C. intermedia, 2 (1.7%) by C. theae and 1 (0.8%) by C. haemulonii. Based on CLSI breakpoints 2012 (CBPs) , the rate of susceptibility to fluconazole was 93.0%, 95.8%, 66.7%, 85.7%, 100% and 0% for C. albicans, C. parapsilosis, C. tropicalis, C. guilliermondii, C. sake and C. krusei, respectively. The rate of susceptibility to itraconazole was lower in C. albicans in our study (79.1%) when compared to fluconazole (93.0%) and voriconazole (95.3%). Amphotericin B and 5-flucytosine remained close to 100% susceptibility against common Candida spp., except for C. krusei and C. guilliermondii (only 20% and 71.4% susceptible to flucytosine, respectively), according to ECVs  (showed in Table 3). Due to lack of CBPs of amphotericin B and flucytosine for Candida spp. and itraconazole for Candida non-albicans, the epidemiological cutoff values (ECVs) were used . Empiric antifungal therapy was administered in 97 (80.2%) of the cases while 24 (19.8%) patients did not receive any antifungal treatment. Fluconazole was most frequently used (62.9%), followed by caspofungin (18.5%) and any formulation of amphotericin B for (6.2%). Four patients (4.1%) received a combination therapy (fluconazole + caspofungin and fluconazole + amphotericin B in 2 cases each). Eighty-six (71.1%) of 121 patients with Candida BSI received an appropriate empiric antifungal agent. Patient outcomes at 28-day, stratified by yeast species, are reported in Table 2. The overall, 28-day crude mortality rate was 28.1%. Mortality rate was significantly higher in internal medicine than in surgical wards or in ICU (48.1% vs. 17.4% or 27.1%, respectively, p = 0.018). 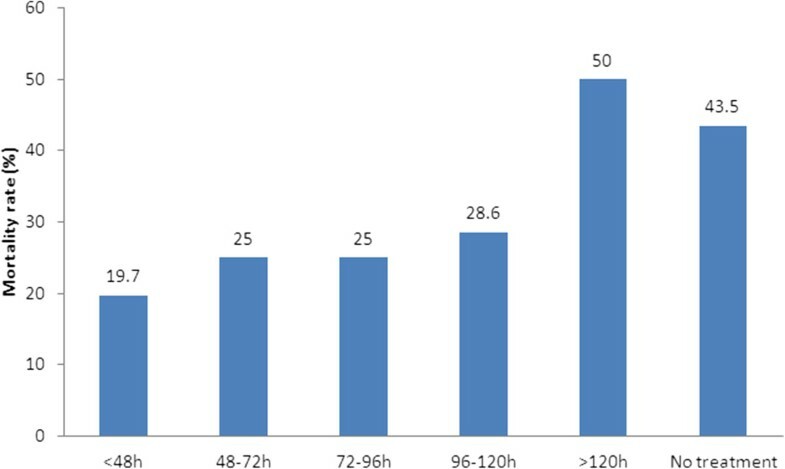 Though still considerable, mortality was significantly lower for those who received appropriate empiric antifungal therapy than inappropriate empiric antifungal therapy (20.9% vs. 45.7%, p = 0.006) within 5 days the first positive blood culture performed (shown in Figure 2). There was a significant difference in survival between the two groups [Log Rank (mantel-Cox) chi-square =12.784, P < 0.001] (shown in Figure 3). Relationship between hospital mortality (28-day) and the timing of antifungal treatment. The timing of antifungal therapy was determined to be from the time when the first blood sample for culture that was positive for fungi was drawn to the time when appropriate antifungal treatment was first administered to the patient. 28-day mortality was significantly lower for those who received appropriate empiric antifungal therapy within 120 h (5d) vs. inappropriate or delayed (>5d) empiric antifungal therapy or no antifungal treatment (20.9% vs. 45.7%, p = 0.006). Kaplan–Meier survival curves (28-day) based on the initiation of empiric appropriate antifungal therapy [Log Rank (mantel-Cox) chi-square =12.784, p < 0.001]. In univariate analysis, gender (male), presence of sepsis, neutropenia and appropriate empiric antifungal therapy were associated with 28-day mortality. In multivariate analysis, advanced age (OR, 1.038; 95% CI, 1.007-1.069; P = 0.014), neutropenia (OR, 17.442; 95% CI 3.555-85.582; P < 0.001) and appropriate empiric antifungal therapy (OR, 0.369; 95% CI 0.146-0.934; P = 0.035) remained independent risk factors for 28-day mortality (Table 4). Our data show that in our teaching hospital in Shanghai, the incidence of candidemia has increased steadily in the past 5 years (0.21 to 0.42 episodes per 1,000 admissions). Several studies have shown a substantial increase in the incidence of candidemia in the past 2 decades [3–5], with an incidence of 0.3-1.0 episodes per 1000 admissions elsewhere in China , North America [29, 30] and some European countries [3, 31, 32], much higher (1.2 to 1.7 episodes) in Latin America  and Italy , and much lower in Northern Europe (0.01 to 0.08 episodes) [34, 35]. Species distribution here consisted in C. albicans, followed by C. parapsilosis, C. tropicalis and C. glabrata, overall accounting for more than 70% of episodes of candidemia. Although C. albicans is still considered the most common species causing candidemia, trends of increasing rates of non-C. albicans have been reported worldwide [3, 10, 36], which was also observed in our study (37.2% for C. albicans vs. 62.8% for non-C. albicans). The reasons for the emergence of non-C. albicans species are not fully understood, but some studies recently showed that medical conditions may influence the risk of developing non-C. albicans invasive infection. Indeed, C. parapsilosis candidemia has been associated with vascular catheters, parenteral nutrition and prior exposure to echinocandins . C. tropicalis is associated with older age, cancer and neutropenia [37, 38], and C. krusei and C. glabrata are associated with previous exposure to azoles and echinocandins [39, 40]. Although no statistical analysis was performed here on the interaction between patient’s clinical features and Candida species, because of small sample size, the trends of distribution are partially supportive of these reports: 33-60% patients infected with C. tropicalis or C. krusei had hematologic malignancy and neutropenia; four of five (80%) patients infected with C. krusei had prior use of antifungal therapy; 40-55% patients infected with C. glabrata or C. krusei received mechanical ventilation. Of note, our study showed that presence of sepsis symptoms was predominant in patients infected with C. albicans (88.9%), C. tropicalis (94.4%), C. guilliermondii (85.7%) and C. sake (83.3%) rather than in patients infected by other Candida species (44.4%-60.0%). Interestingly, we observed in the present study that C. guilliermondii and C. sake represented 5.8% and 5.0% of the isolates; while only 0.2%-2.4% of C. guilliermondii was observed in European countries [11, 18, 41, 42], in Taiwan  and in Latin America except in Honduras (20%) . The emergence of severe sepsis due to C. sake is here remarkable, knowing that the latter species represented only 0.03% of isolates in a recent publication from ARTEMIS . A lower percentage of C. albicans (18.5%) was observed in internal medicine wards compared with surgical wards (43.5%) and ICU (41.7%) while C. tropicalis and C. parapsilosis were more frequent in internal medicine wards. Antifungal resistance was a rare finding in our study and was restricted to azoles, except in C. tropicalis. We found a higher rate of fluconazole SDD or resistance C. tropicalis here (5.5% and 27.8%, respectively), while other studies showed a prevalence of less than 10% [4, 33, 45–47]. In the present study, almost 19.8% of patients did not receive any antifungal treatment. The most likely reasons were late diagnosis, since one-third of these patients died within 7 days after the onset candidemia, and the poor compliance to antifungal therapy in some wards. Fluconazole was the most frequently administered antifungal agents as empiric therapy, followed by the echinocandins. Echinocandins were used infrequently despite their efficacy in the treatment of candidemia and their recommendation to be used as first line therapy in the recent ESCMID guidelines [17, 48], because of their price compared with fluconazole. We report an overall, 28-day crude mortality rate of 28.1%. A statistically significant finding is the high 28-day mortality rate for Candida BSI in patients from internal medicine wards compared with other wards. The factors contributing towards poor short-term survival in internal medicine should be explored in future studies. Another major finding in the present study was that delay in initial appropriate empirical treatment for Candida BSI of at least 5 days after the first blood culture was performed was associated with a greater risk of 28-day mortality. Our results confirm recent studies’ results, in which a relationship between delaying the initiation of antifungal therapy and mortality was demonstrated [24, 49]. For example, Bassetti et al. showed that the initiation of antifungal treatment 48 h after having the first positive blood culture report was an independent determinant of hospital mortality. The results of previous studies on this topic have yielded conflicting results [20, 21, 50]. Hsu et al. investigated patients who received an echinocandin for Candida BSI; early (<3 days) versus late (>3 days) initiation of caspofungin was not associated with hospital mortality. Parkins et al. showed although appropriate empirical antifungal therapy was protective against hospital mortality, no association was found between timing of antifungal administration and mortality. Similarly, Kludze-Forson et al. reported the lack of any association between the timing of appropriate antifungal therapy and hospital mortality; of note, increased APACHE II score was the only independent predictor of mortality. Reasons for observing different results among various studies investigating the impact of timing of antifungal therapy on outcomes is unknown, but multiple complex factors are likely responsible. Our study showed in multivariate logistic regression analysis, the significant association between 3 variables (age, neutropenia and appropriate empiric antifungal therapy) and 28-day mortality. Appropriate empiric antifungal therapy was here a protective factor. Although providing data from a large university hospital in Shanghai, our study has some important limitations, the most significant being its retrospective nature. The severity of illness score (such as APACHE II score), timing of CVC removal were not included because of missing data. Second, our study was monocentric and the results may not be applicable to other settings. In conclusion, our retrospective study showed the incidence of candidemia has increased in the past 5 years in Shanghai. We observed a predominance of non-C. albicans Candida species, with C. guilliermondii and C. sake representing more than 10% of the isolates. However C. albicans remained the most frequently isolated species. 28-day mortality in internal medicine wards was unacceptably high. Finally, appropriate empiric antifungal therapy influenced the short-term survival of patients with candidemia. The incidence of candidemia has increased in the past 5 years at Ruijin hospital in Shanghai. C. albicans remained the most frequently isolated species, while a predominance of non-C. albicans Candida species was observed, with C. guilliermondii and C. sake representing more than 10% of the isolates. Twenty-eight-day mortality rate was significantly higher in internal medicine than in surgical wards or in ICU. Advanced age, neutropenia and appropriate empiric antifungal therapy remained independent risk factors for 28-day mortality. Zhi-Tao Yang, Lin Wu contributed equally to this work. This work was supported by a grant from EGIDE Program Xuguangqi 2011 of France (Grant No. 26204ZB) of which Pr. Olivier Lortholary and Dr. Zhi-Tao Yang are co-princ investigators. Authors thank to Pr. Xin-Xin ZHANG, Infectious disease department and Pôle Sino-Français de Recherches en Science du Vivant et Génomique of Ruijin Hospital in Shanghai, for her helpful discussion and general support. ZTY, LW, EZC and OL made substantial contributions to conception and design. ZTY, LW and XYL participated in acquisition of data. ZTY and YC participated in data analysis. ZTY and LW drafted the manuscript. EZC and OL revised the multiple versions of the manuscript critically. All authors read and approved the final manuscript.